Last summer we posted about new regulations regarding how chemicals are labeled. 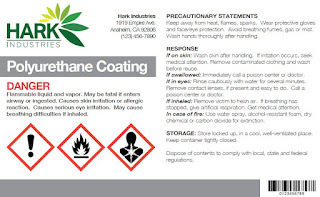 OSHA is mandating a conversion to an internationally universal system called GHS (Globally Harmonized System of Classification and Labeling of Chemicals). This system is already mandatory for chemical manufacturers and distributors. Starting June 1, it is now mandatory for any workplace that uses or stores hazardous materials to use GHS-compliant labeling. The GHS label system is more comprehensive than the old standard, putting the most essential information from a material safety data sheet directly on the container. It includes the exact material name, pictograms identifying specific hazards, supplier information, and instructions for handling, storage, and accident prevention/response. If the chemicals in your workplace do not comply with these standards, you will now be subject to fines. The good news is that if chemicals are kept in their original containers, they are probably already labeled properly. These regulations already kicked in for the manufacturers and distributors of chemicals, so anything bought since then left the factories and distribution centers good to go. However, workplaces will still have to update labels for chemicals purchased before this system kicked in, or chemicals that are no longer in their original containers. Thankfully there is help available. 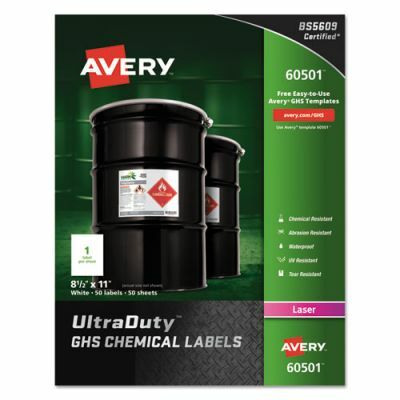 Avery's GHS Chemical Labels make GHS compliance easy with software pre-formatted to GHS standards. Fill out basic information and the software will look up the material in its database and fill out the correct details for you. These labels are also designed to stick to containers and stay legible, resisting the elements, scratching, tearing, and the chemicals themselves. With both the software and the right labels, complying with these new standards will be easy.